Mired under heavy debts, GigaWatt, one of the earliest players in Central Washington's bitcoin boom, has filed for bankruptcy protection, the latest casualty in an industry hammered by falling prices. For cryptocurrency pioneer GigaWatt, the hits just keep coming. On Tuesday, as the bitcoin market continued its weeks-long swoon, employees of the East Wenatchee company, which hosts thousands of computer servers for cryptocurrency mining, learned that the company’s owners had put it in Chapter 11. “It was sprung on us,” said interim manager George Turner, who heard about the bankruptcy from a business associate. Turner, tapped earlier this fall to cut staff and other costs at the heavily indebted company, was himself terminated on Tuesday as well. Monday’s bankruptcy move follows the August departure of GigaWatt co-founder David Carlson. This month the company’s landlord began eviction proceedings. It’s the latest twist in an entrepreneurial saga stretching back to the early days of bitcoin. Carlson, a former Microsoft engineer who began mining bitcoin as a hobby in 2012, was among the first miners to tap the cheap hydropower of Central Washington. In 2013, Carlson built what was then the world’s largest bitcoin mine, in an old furniture store in downtown Wenatchee, and later expanded into hosting services for other miners. Bitcoin and other cryptocurrencies are produced by solving ultra-complicated math problems with powerful computer servers. Those computers consume huge amounts of power — a single bitcoin today can cost around $2,500 in power, Turner said — which is why Carlson came to Central Washington, where power sells for less than a quarter the national average. 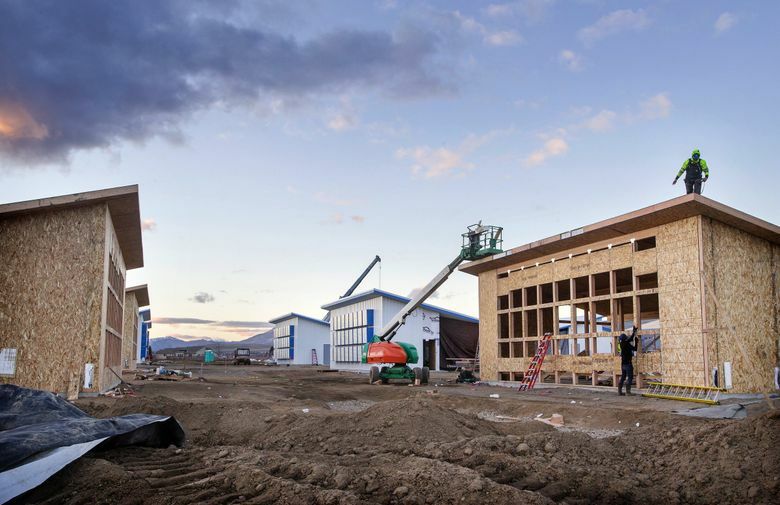 In 2017, as prices for bitcoin soared toward $20,000 and would-be miners from the around the world poured into Central Washington, Giga-Watt launched an ambitious expansion: a multimillion-dollar campus of 24 prefabricated “pods” where would-be crypto miners could set up their own cryptocurrency servers. The pod project was backed by local government officials, who saw GigaWatt and other cryptocurrency companies as a way to transform the local agricultural-based economy. The site of GigaWatt’s pod project was a 9-acre parcel near the Douglas County airport that was leased from the Port of Douglas County, whose offices are next door to GigaWatt’s. But GigaWatt has struggled to deliver on those ambitions. The crash in cryptocurrency prices since December of 2017 (bitcoin is now trading for around $4,400) has made it difficult to attract investors or hosting clients, Turner said. GigaWatt has also been mired in legal troubles with investors, who collectively paid GigaWatt $22.6 million, mainly in the form of cryptocurrencies, in exchange for special Giga Watt digital coins or “tokens,” Turner said. These tokens entitled the investors to use GigaWatt’s hosting services for their own mining computers, at a discounted price, once those services came online, Turner said. That money was in addition to $25 million in backing from Carlson and the company’s three other owners. All told, some $47 million has been put into GigaWatt, according to figures previously provided by a company spokesman. But thanks to construction delays and costs overruns, the hosting facilities were never completed and investors have filed at least four lawsuits against GigaWatt, including one last month. According to Monday’s bankruptcy filing, GigaWatt has less than $50,000 in assets against nearly $7 million in creditors’ claims. Creditors range from the Douglas County Public Utility District, with a claim of $310,000, to two Singapore-based firms — Cryptonomos PTE and GigaWatt PTE — with combined claims of $3.67 million. Liens filed against the company by construction companies violated the company’s lease with the Port of Douglas County, which initiated eviction proceedings in early November. With Monday’s bankruptcy filing, the eviction process is “on hold,” said port executive director Lisa Parks, who said the port remains hopeful that GigaWatt or another operator can finish the project. “The goal would be to have the project in some way shape or form completed so that it is a productive use for both the port district, in terms of lease revenue, but also providing jobs and economic growth for the community at large,” Parks said. Prospects for such an outcome aren’t clear. Earlier this fall, Turner, the former interim director, launched a turnaround strategy that included cutting its staff from 62 to 19 and using some company facilities to mine bitcoin. But that strategy was terminated with the bankruptcy.